iPhone 5S Data Recovery: Recover iPhone Data from iTunes or iCloud Backup in a Minute! Recover iPhone Data from iTunes or iCloud Backup in a Minute! In the previous article, we studied how to backup iPhone 5S data, then some readers puts forward a new problem “how can I restore iPhone data from an iTunes or iCloud if I have backed up the files?” Good question! Therefore, today I gonna show you how to restore iPhone 5S data from backup by taking a step-by-step approach. Please Note That: Make sure iTunes doesn’t automatically sync with iPhone when connected! For that every time iTunes sync with iPhone, the previous backup file will be covered by the current data in iPhone, you know, how serious it is. Just take a look at the following guide to restore iPhone contacts, photos, text messages, notes, call history, bookmarks, WhatsApp etc. from iTunes backup file after deleted or lost. 1. Double-click iTunes application on your computer to open iTunes. 2. Connect your iPhone to your computer with a USB cable just as you would to sync it normally. Locate the iPhone in the "Devices" column at the left of the iTunes window. iTunes will prompt you to restore from backup if you have a new or erased iPhone. 3. 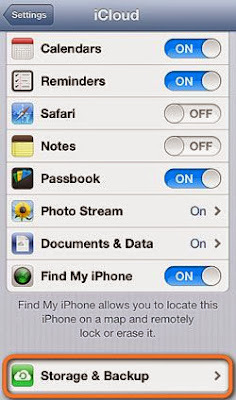 Right-click on the iPhone icon in the "Devices" column and choose "Restore From Backup" Select one of the backup versions from the drop-down menu and click the "Restore" button. This way will recover any data from the iTunes backup file you last synced. It would be must better if I can recover data from the backup I made any time. Actually, it have been come true since Tenorshare iPhone Data Recovery program enable to backup iPhone files to computer perfectly. I believe everyone’s computer has sufficient capacity to save the iPhone files and easily to get it whenever necessary. You can get 5GB of free storage once you sign up for iCloud, and iCloud Backup works well. So, don't neglect this use when consider your data safety. First of all, make sure you have an iCloud backup, then check the 4 simple steps to recover contacts, calendars, bookmarks, mail messages, notes, shared photo streams, My Photo Stream, and documents from iCloud backup. STEP-1: The process will run away with a lot of electricity so that it is necessary to plug iPhone into the charger. STEP-2: Connect iPhone with a good Wi-Fi. STEP-3: Check “Restore From iCloud Backup” option, then enter the username and password of iCloud account when prompted. STEP-4: When the restore is over, iCloud will begin to download apps. Go to Settings -> iCloud -> Storage & Backup to check if the restore is finished. As long as you have synced iPhone with iTunes, backed up iPhone files to iCloud or your computer, you will never worry about losing iPhone data and feel frustrated by having no idea on how to recover iPhone backup files!